Pharmaceutical Biotechnology Book from C.H.I.P.S. Cryopreservation: Applications in Pharmaceuticals and Biotechnology provides a foundational introduction to the cryopreservation of biological materials and their development into pharmaceutical products. It is a critical study based on today's requirements for rapid development of biologically derived dosage forms of drugs. 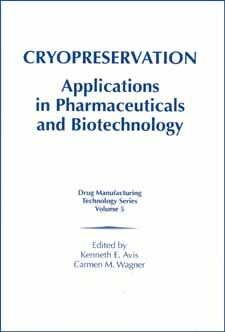 This book covers the principles of cryopreservation as they relate the preservation of viable cells and cell materials being developed for biopharmaceutical applications. Contributions from well-known experts such as Steven S. Lee, Thomas C. Pringle, William H. Siegel, Richard Wisniewski, and Fangdong Yin make this the single most important study available.